As the brightest star in the night sky, Sirius is familiar to schoolchildren and professional astronomers alike. In 1844, Friedrich Bessel noticed that the position of Sirius had “shewn remarkable change” since 1755 and postulated that the change in Sirius’s position was due to the gravitational influence of an unseen companion. As Bessel wrote, “the existence of numberless visible stars can prove nothing against the existence of numberless invisible ones.” Bessel’s unseen star was Sirius B, a 0.98 Solar mass white dwarf. Sirius B was first observed by Alvin Clark and reported by George Bond in Astronomische Nachrichten (Astronomical Notices). In more recent history, several authors have detected signs of a possible third object in the Sirius system. According to Benest & Duvent 1995, the companion, known as Sirius C, would have a mass of less than 50 Jupiter masses and orbit Sirius A with a period of approximately 6.3 years. In this paper, Thalmann et al. 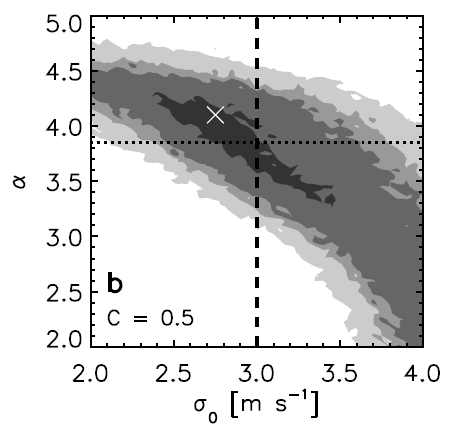 conduct direct imaging observations of the Sirius system with the Subaru Telescope and the MMT Observatory to try to detect Sirius C. They do not see any companions at the 5 level and therefore place an upper limit of 12 Jupiter masses on the mass of Sirius C.
The authors combine observations of the Sirius system acquired with the Clio 3-5 micron imager at the MMT Observatory on December 5, 2006 and with IRCS (InfraRed Camera and Spectrograph) and the AO188 adaptive optics system at the Subaru Telescope on January 20, 2011 and March 12, 2011. The Subaru images were taken using a Br narrow-band filter at 4.05 microns and the MMT images were taken in M-band (roughly 4.6-5 microns). For all of the images, the authors allow the field of view to rotate over the detector during the image while holding Sirius A steady in the center of the field. This mode of observation is known as angular differential imaging (ADI, Marois et al. 2006). For most astronomical observations, the image rotator is adjusted so that the field of view remains in the same orientation for the duration of the observation sequence. For instance, if you were observing Venus and there were three stars in the upper left corner of the field of view, then those three stars would appear in the upper left corner in all of your images. However, if the image rotator is turned off (or adjusted to a different rate), then the three stars would appear to spin around Venus as the sky rotated overhead during your observations. See Christian Thalmann’s webpage for another explanation of field rotation. The advantage of allowing the field of view to rotate on the detector is that the noise speckles caused by defects in the telescope and the presence of telescope support struts will remain on the same pixels in each image. These speckles evolve during the course of observations, but the speckle pattern is similar enough that many of the speckles can be removed by subtracting adjacent images from each other. More specifically, the authors use an image combination and subtraction routine known as LOCI (Locally Optimized Combination of Images, Lafrenière et al. 2007) to reduce the presence of speckles in their images. The detection completeness for companions as a function of eccentricity and companion mass. The left frame shows the detection completeness if Sirius C is coplanar with Sirius B and Sirius A. The right frame displays the detection completeness for planets with unrestricted inclination. Black regions indicate companions that would not have been detected at all while white regions indicate companions that would have been detected in all cases. The authors rule out companions more massive than 6 Jupiter masses for coplanar companions and companions more massive than 12 Jupiter masses for companions with unconstrained inclination. Figure 4 from Thalmann et al. 2011. The authors do not find any signals at the 5 level in any of the three epochs. 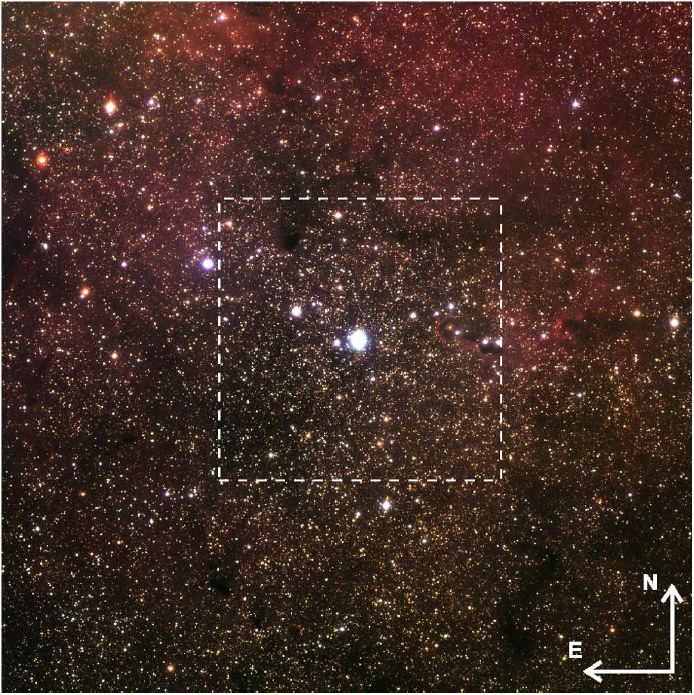 They also report that Sirius B does not appear to have excess infrared emission. This emission was reported by Bonnet-Bidaud & Pantin 2008 and would have been a sign of a circumstellar dust. See this astrobite for an explanation of infrared excesses and dust. 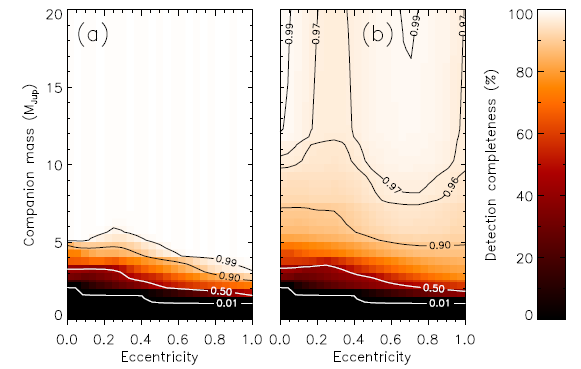 The nondetection allows the authors to place limits on the mass of Sirius C. They use a computer simulation to create companions with a range of eccentricities, orbital phase, inclination, and mass and then determine whether they would have detected each companion. As shown in the figure to the right, their detection limits are sufficient to rule out all companions more massive than 12 Jupiter masses for any inclination and all companions more massive than 6 Jupiter masses for objects in the same orbital plane as Sirius B. Thalmann et al. would have been sensitive to planets as small as 6-12 Jupiter masses at a distance of 1″ from Sirius A, 2-4 Jupiter masses at 2″, and as small as 1.6 Jupiter masses at distances greater than 4″. Accordingly, if Sirius C exists, it most likely has a mass of a few Jupiter masses or smaller. I really found this article interesting. Thank you for your concise explanation of ADI and your summary of study on, my personally favorite star, Sirius. I’m excited about the amazing technologies today to determine presence of exoplanets, direct observation of some very large exoplanets, and the development of new strategies and technologies. I’m hopeful the James Webb Telescope will light up our galaxy with brilliant images and even more captivating ideas about the universe.